Waterfront Paradise! Stunning home nestled in sought after waterfront community of Symphony Isles, the best kept secret in Apollo Beach. Symphony Isles is a tropical paradise w/ palm trees, tropical trees & plants, gated, private streets, clubhouse, playground, private beach & boat ramp. This 3,771 sqft home w/ beautiful double door entryway & wide scenic views of patio, pool & saltwater canal. 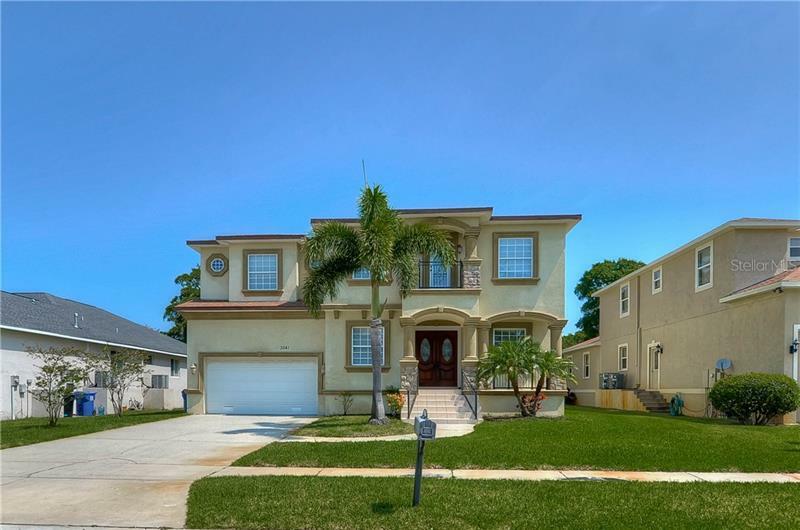 2 story, 3 car garage, pool home features an open floor plan, 3 full baths, 2 half baths, 4 bedrooms, study, split bedroom floorplan & plantation shutters throughout, family room w/ gas fireplace, sliding doors pocket back to reveal covered, screened patio w/ wet bar for drinks & conversation. Enjoy fenced yard, tropical landscaped views of pool area w/ travertine pavers & attractive canal views. Dining room w/ wine refrigerator. 2 bedrooms downstairs, 2 full baths w/ closet space & half bath off pool area. Kitchen w/custom cabinets, stainless steel appliances, stone surfaces, GE profile refrigerator, gas range w/ hood, Bosch dishwasher, island, separate breakfast area overlooking patio, pool & canal, utility room. 2nd level w/ open loft area before master suite w/ built- ins, wet bar, refrigerator, gas fireplace. Long & wide balcony w/ views of pool & canal. Master bath w/ separate commode area, walk-in shower, 2 shower heads, 2 vanities, jetted tub & closet space. Pool area w/ lush tropical landscaping, travertine pavers, walkway to dock area which includes trex decking, electric & water & 10,000 1b boat lift.